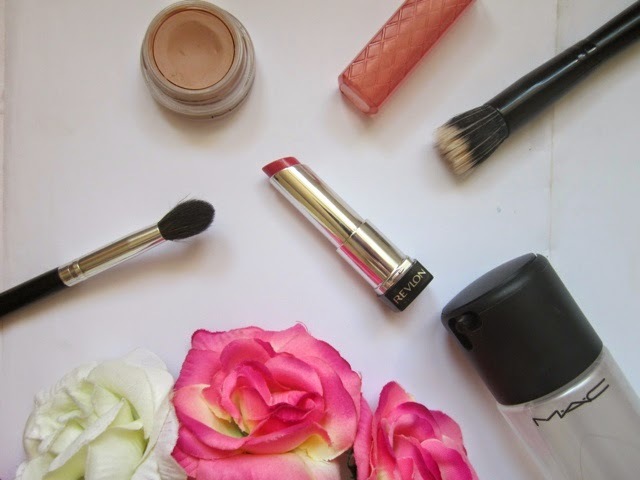 I realise I've been a little absent from blogger recently so what better way to update you on the beauty products I'm using and enjoying than a favourites post? I've finally ditched the powder and turned to this little beauty for setting my base make up. Admittedly, it has taken me a while to fall in love with this product; I got it back in September and I wasn't particularly wowed by it if I'm honest. The thing I love most about this product is that it adds a touch of moisture back into my skin. I douse myself in this stuff after applying my foundation and it just makes my face look so much fresher and healthier! I spray this at arms length as spraying it too close can leave you a little sticky and looking like a hot mess. Even at the best of times eyeshadows don't tend to stick around on my lids for long, so in summer especially an eye primer is an absolute crucial step for me. This particular primer is a triple threat; it prevents creasing, evens out discolouration and makes eyeshadows go on smoother and a lot more vibrant. What more could a gal want from an eye primer? I picked this up a while back in boots on a bit of a whim and even then I was extremely late hopping on the lip butter bandwagon. I'm not one for lip products, therefore I don't own many and often don't add many to my minuscule stash. As I said, this was bought on a whim and I'm so glad I did buy it! It's so subtle on the first swipe but it can be layered to an opaque peach shade with gold shimmers running through it. I definitely need to pick up some more shades - any recommendations? I've been opting for a lighter base now that we are well into the warmer months, and this brush really delivers a light but flawless base. I use it in conjunction with my L'oreal True Match Foundation and they really are the dream team. I apologise for not washing the brushes before showing them (just keeping it .. er .. authentic, you know) but the bristles come up really clean. There's nothing more satisfying than seeing a clean duo fibre or any white haired brush in your stash, ey? I haven't experienced any shedding or the dye coming out, which is amazing for how affordable this brush is! This brush is the queen of blending for me. Well, out of the brushes I have. I think it is mainly the style of the brush as it is slightly tapered, helping it to diffuse colours so beautifully and it is really easy to create a blown out smokey eye with this brush. The bristles are soft and delicate on the eye area, but perhaps not the softest of brushes as I think the title of the softest brushes will always go to Real Techniques. For the price, a mere 99p, the quality is great, and I 100% recommend. Although I haven't included it the photograph, I've enjoyed using Sellotape to create a sharp and precise line for really dramatic eyeshadow! What products have you been loving throughout June? 5 comments on "JUNE BEAUTY FAVOURITES"
Really want to try out Mac Fix+ , heard so many good things about it!